On November 29, Members of the European Parliament (MEPs) adopted a report on a recommendation to make academic freedom a human rights consideration in the European Union’s (EU) foreign policy. MEP Wajid Khan speaking at the launch of Scholars at Risk Europe. 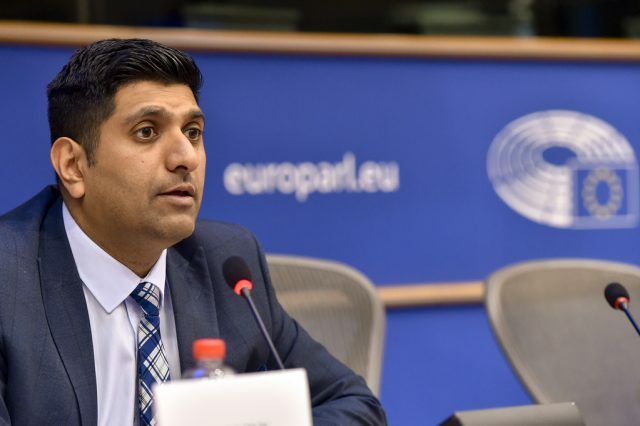 MEP Wajid Khan, of the United Kingdom, drafted and sponsored the recommendation, which expresses concern over attacks on higher education around the world, underscores the importance of academic freedom and institutional autonomy to democratic society, and calls for EU-funded action to ensure the protection of at-risk students and scholars. Scholars at Risk (SAR) welcomes this news and applauds the European Parliament for its leadership in promoting academic freedom. Given rising attacks on higher education communities worldwide, as evidenced by SAR’s Free to Think 2018, which reported a record 294 attacks in 47 countries, efforts like this resolution are vital to protecting academic freedom and scholars. Robert Quinn, Executive Director of Scholars at Risk, commented on the report, “European Parliament is taking a strong public stance on the importance of academic freedom. This is a trailblazing effort to raise awareness of attacks on higher education and promote accountability and international dialogue, helping to ensure everyone’s freedom to think, question, and share ideas.” Mr. Quinn adds, “We look forward to working with the EU and our regional higher education partners to continue efforts to promote academic freedom.” Scholars at Risk Europe, launched November 28th at the European Parliament, will serve as a key convener for these ongoing efforts.